You are here: Home / Training / Cohen the dog who knows 200 tricks! Cohen the dog who knows 200 tricks! Everyone thinks that their dog is the best in the world, and no one is wrong. You can also make your pooch a wonder dog, just like Cohen. Cohen is a five-year-old female Australian Shepherd from Canada. She is a jack-of-all-trades type of dog. She has done agility, flyball, obedience, rally, freestyle and disc. Her specialty is tricks. She knows approximately 200 tricks and behaviours, from the basic sit, paw and roll over to the more advanced walking handstand, hugging her toys and rebounding off my foot. Her favourites are the ones where she gets to run and jump (and bark!). She’s always happy to learn something new because it means she gets to work her body and mind and bond more closely with me. At the end of the day, despite all the crazy things she’s known for, she’s happy to curl up at my feet (sometimes directly on my feet) and sleep. 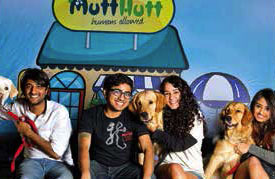 One can teach a lot to a pooch if the trainer has a passion and a bit of know-how and inspire people to try the same. I like to extol the virtues of relationship-focused motivational training, using food, toys and other reinforcers to help build behaviours. And these aren’t just tricks for sport or for fun, but every day, practical behaviours for family pets too. Working on simple tricks to start is a great way to bond with your dog. 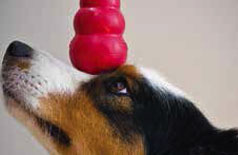 Tricks are fun for you to teach, fun for the dog to learn and they’re low-pressure! If people focus primarily on obedience, there is the pressure that the dog must obey, and that pressure can deflate enthusiasm for both dogs and people. For tricks, it doesn’t really matter if your dog can roll over or shake, so trainers are more likely to relax while teaching them, which results in a relaxed and happy dog. And the best part is that behaviours like sit, down and stay are as much a trick as spins and bows. Trainers just need to approach their obedience training in the same way they approach tricks. Training is meant to be fun for all parties, both human and canine! A great starter trick is spin. It’s relatively easy to teach, dogs tend to learn it quickly, dogs can perform it easily and they have fun while doing so! To teach it, place a piece of food in your hand that is visible to the dog. Place it by the dog’s nose so she can smell and lick it and slowly lure them around in a circle. The treat should be no more than 2-3 inches from the dog’s nose at all times, so don’t move it too fast. Once the dog is about 1/2 – 3/4s around, mark it with a ‘yes!’ and give them the treat. Do this a few times until they’re reliably following the lure. Start saying ‘spin’ (or whatever you want your cue to be) as you start moving your hand. Then begin to fade the lure so your pup is following your empty hand, but rewarded with a treat at the end. Once you have the dog reliably turning one way with no lure, start working on the other direction! So, make training fun and see your dog amaze you with her prowess. http://www.dogsandpupsmagazine.com/wp-content/uploads/2015/07/Untitled-141.jpg 155 238 Dogs and pups Magazine http://www.dogsandpupsmagazine.com/wp-content/uploads/2017/05/1254nal.jpg Dogs and pups Magazine2015-07-14 16:41:382015-07-14 16:41:38Cohen the dog who knows 200 tricks!